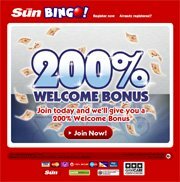 Launched in January of 2006, Sun Bingo has made a large splash in the online bingo industry, jumping up the ladder to become one of the UK's top ranking bingo sites. Sun Bingo offers players 75, 90 and 80-Ball Bingo, as well as a lot of entertaining side games. Licensed and regulated in Gibraltart, the sun bingo software, developed by Gamesys, is incredibly smooth and easy to navigate. Sun Bingo has a great welcome bonus offer, matching the first deposit 100% up to £100, with plenty of valuable promotions to come, such as B1G1F games, free bingo games every Tuesday, massive jackpots and chances to win a holiday package for the whole family. Sun Bingo offers all of your favorite online bingo games, including traditional 75-Ball Bingo, Europe's favorite 90-Ball Bingo and the newest version, 80-Ball Bingo. Ticket prices start as low as 1p and 2p. You can also find a lot of But One Get One Free (B1G1F) bingo games in the promotions lobby. So be sure to look for these. Also be sure to join in the action every Tuesday for free bingo games with real cash prizes up for grabs! Sun bingo isn't just about online bingo. You'll also find a multitude of side games, especially in the online slots department. Side games include Queen of Egypt, Pirates Plunder, American Dream, Yeah Baby, Tycoon's Treasure, Spinning for Gold, Winning Streak, Footballer Widows, Snap and High 5. Sun Bingo is powered by software from Gamesys, supplying a solid, browser-based platform that is fast, reliable and very easy to navigate. There is no need to download any software. The Java-based bingo games are compatible with all major operating systems. There are a few customization features to tweak a player's experience, including the ever-popular Auto-Daub function. This feature instantly marks off all called numbers so that players can enjoy the bingo chat and/or side games without ever missing a bingo. In fact, Bingo will automatically be called for you, should you win a game. Sun Bingo offers friendly, professional customer support 24/7 via email and telephone. There's no live chat support per-say, but the chat monitors are always on hand in to answer any questions while you're in a bingo game, or in the Sun Bingo lobby. Sun Bingo has a minimum deposit amount of £10, maximum £1,000 per deposit. Players are not permitted to make a deposit if their current cash balance is £250+. Debit card depositors will be able to withdrawal via bank transfer or check only. Deposits: Visa, MasterCard, Visa Delta, Visa Electron, Solo and Maestro. Withdrawals: Visa, MasterCard, Bank Transfer and Check.